XHTML 1.0 does allow you to create multiple forms in a single XHTML document. Most browsers will display and handle multiple forms properly. 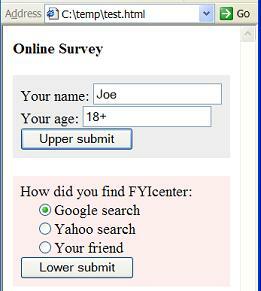 If click a submit button in one form, browsers will submit input data only for that one form. Input data from other forms will be ignored. Your age: <input type="text" name="name"